Our wander around the halls of the Geneva Motor Show yesterday started at the Nissan stand. 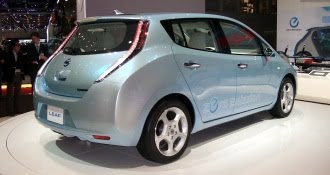 The pre-production Leaf electric car looks much more attractive, cohesive and striking in real life, in its pearlescent paint, than in pictures. The rear three quarters is our favourite angle. As with all the other photos we’ve seen, this one doesn’t do the car justice. Styling is, of course, the least of its challenges - we are still waiting to learn exactly how much the Leaf will cost, for example. Nissan is still sticking to the line that it will be cost-competitive with conventional cars, after government incentives, at launch. It also predicts that economies of mass production will mean the cost will drop enough to remain competitive beyond 2012, when some target markets will begin to withdraw stimulus funding. The UK’s electric-car handouts halt in January 2014. Pininfarina’s Bluecar turns out to be taller than we’d expected, judging from the images we’d seen to date. Somewhat the opposite of the Leaf, it’s also, sadly, not quite as lovely on the eyeball as in pictures. Black paint on the slabby sills might create a svelte profile on camera, but it doesn’t really fool the eye in person. 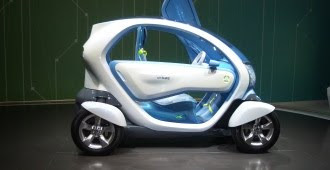 The Bluecar is still about 99 per cent more attractive than most electric car prototypes, of course. Oh, and the model in the purple dress wouldn't get out of the way for our snap. Or, indeed, smile. 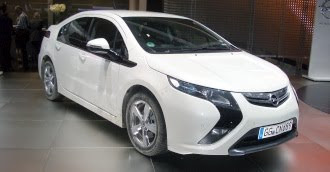 Opel’s Ampera was the only dirty car among a host of polished and preened metal at Geneva. This particular rolling prototype was driven 300-odd miles to the show from Rüsselsheim, rather than cadging a lift aboard a truck, so the mud was a badge of pride. Clearly Opel still feels the need to persuade people that its range-extended electric vehicle can actually work in the real world of grime, brake dust and blown fuses. 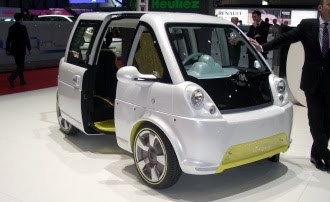 Renault's Twizy electric tandem two-seater had subtly altered since we last clapped eyes on it, in Paris. The wheels have changed - they are now smaller, and no longer covered in their striking hexagonal spats. The new wheels make quite a radical difference to the Twizy's unique stance - it now seems lower, longer, less fragile looking, but also a lot less striking. It's a shame to see these sensible shoes appear on such a rebellious concept. What next - proper doors? The Honda CR-Z turns out to be as small and perfectly formed as expected. Apart, that is, from its droopy rear window profile and predictably brittle plastic interior. If it goes as well as it looks and feels from the stationary driver's seat, it will be a hit, unlike the unfortunate Insight on which it's based.